Dogs might be some of the most friendliest pets man has had for a long while, but they don’t come without headaches and annoyances. While the problems that dogs pose depend a lot of the type of dog and the training they had early on in their life, no dog is always a good dog, so let’s find out how to solve common dog behavior problems. Even the most quiet, stable and well trained dog has accidents now and then, so it’s a good idea to know how to deal with some of these issues. There are a lot of possible problems when it comes to a dog’s behavior, but we’ll take a look at the most common. Dogs bark. It’s their job to do so. Sometimes though, too much barking is annoying and can become a problem. Before taking care of the matter, find out the root cause. It can be a warning for something that’s happening outside, or maybe barking at another animal outside. Other times he may be wanting you to play with him or looking for your attention. On the other hand, a dog can also bark because he’s anxious about something or even bored. That’s when he can become annoying. The best thing to do is to try and solve the underlying cause if that’s possible. Get him some toys, take time to play with him more often, go outside for some exercise, or consult a vet for the anxiety problem. In addition to that, train him to be quiet on command. Be patient and pay attention to details and you’ll go a long way. Chewing is a natural behavior for dogs, as their ancestors were chewing bones to get to the tasty marrow inside. Since dogs are our pets now, they get to chew a lot more than bones. And that’s not a good thing, especially if it’s your newly bought furniture. As with barking, chewing might be a sign of excess energy, so make sure you help him or provide means to consume it. Anxiety and boredom could also lead to chewing, so make sure you give him a lot of toys to chew on and teach him not to chew your stuff. Short, sharp commands like ‘no’, if taught the right way, will teach him what’s ok to chew and what isn’t. 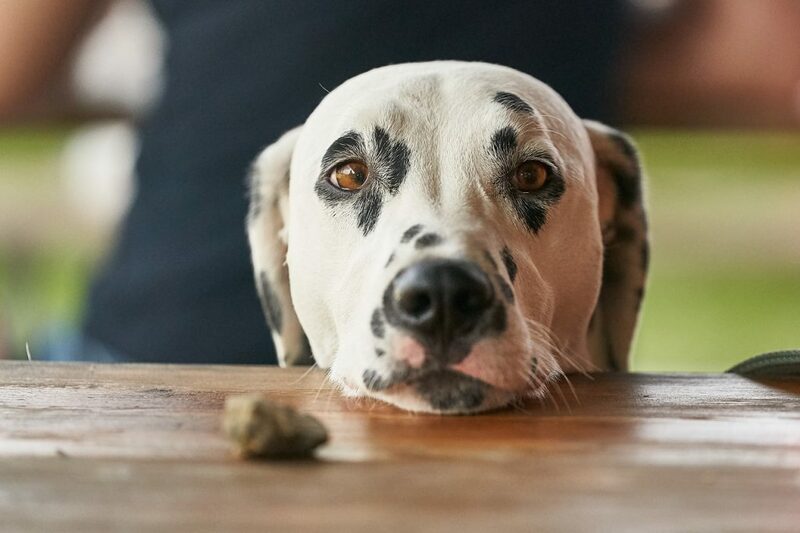 Begging is also part of the common dog behavior problems, one that can become annoying after a while. They whine and whine until you – or somebody else – gives them something. But that’s the wrong way to do it. Your furry tail chasing friend has his meal and you’ve got yours. No sharing. Begging is a bad habit and many owners either don’t care about it – until it gets annoying – or simply encourage it. But if you want to have a quiet dog when you’re eating, you’ve got to teach him that begging isn’t good. Sending him to his place or even locking him in another part of the house will do the trick, but you can also go further and train him to stay put while you’re at the table.